In this paper, we consider the problem of capacity provisioning for an online service supported by advertising. We analyse the strategic interaction between the service provider and the user base in this setting, modeling positive network effects, as well as congestion sensitivity in the user base. 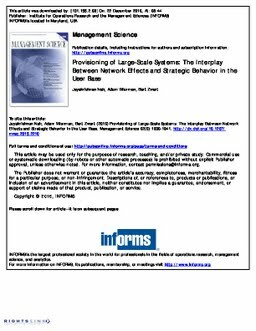 We focus specifically on the influence of positive network effects, as well as the impact of noncooperative behavior in the user base on the firm’s capacity provisioning decision and its profit. Our analysis reveals that stronger positive network effects, as well as noncooperation in the user base, drive the service into a more congested state and lead to increased profit for the service provider. However, the impact of noncooperation, or “anarchy” in the user base strongly dominates the impact of network effects.